Cultured and well-read, she had friends and relatives in many Sephardic communities in Eastern Europe and the Mediterranean. In 1904, when Spanish author Ángel Pulido began research for a follow-up to his book Sephardic Jews and the Spanish Language, Alcalay became his research assistant. Pulido urged her to write to him about the customs of Sephardic women. Below are excerpts of her replies, which offer a window into gender relations in that era. You’ve set me a rather hard task, telling you about Sephardic women… I must duly acknowledge their moral virtue: Adulterous women, fallen girls, are as rare as white flies. How could it be otherwise, since right from girlhood we are warned constantly about the sin and horror that prostitution brings? The second virtue is love of home, of family, and especially charity and love for our fellow man. My good father used to tell me, “Daughter, the poor man and the beggar, all share the same religion. Give to anyone who holds out a hand to you.” Sephardic women deserve every praise for their domestic virtues, for they are very capable and thrifty. You asked about our more affectionate feminine customs. First, I’d like to tell you about everyday blessings. A young woman typically greets an older woman by saying Beso sus manos (“I kiss your hands”). If the younger woman is unmarried, the old woman blesses her by saying Dicha y suerte buena tengas (“May you have happiness and good luck”). If she is married, Tures dichosa (“May you stay happy”) or just Dichosa y alegre (“Happy and joyful”). If she is pregnant, Bien parido de un hijo (“May you have a healthy boy”). People love daughters after we’re already born: “forza maggiore,” as the Italians say—an unavoidable Act of God. no hay hermanos ni parientes. Look carefully and pay attention. There are no siblings or parents. It has an Arab melody that is as sad as the lyrics, but it is a much-needed admonition to the girl. 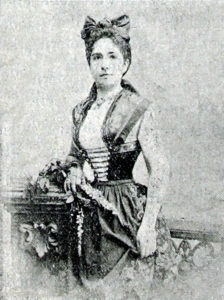 Micca Alcalay in folk dress, late 19th century. I was sent here by my king. Away to wear my wedding ring. I’d give them my own bread. Shall never be my bride. And choose the bride you please. A newborn rose has pierced my heart. 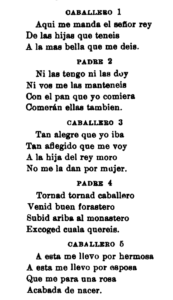 I translated these letters from the book that Micca Gross Alcalay helped to research: Españoles sin patria y la raza sefardí (Spaniards without a country and the Sephardic race). 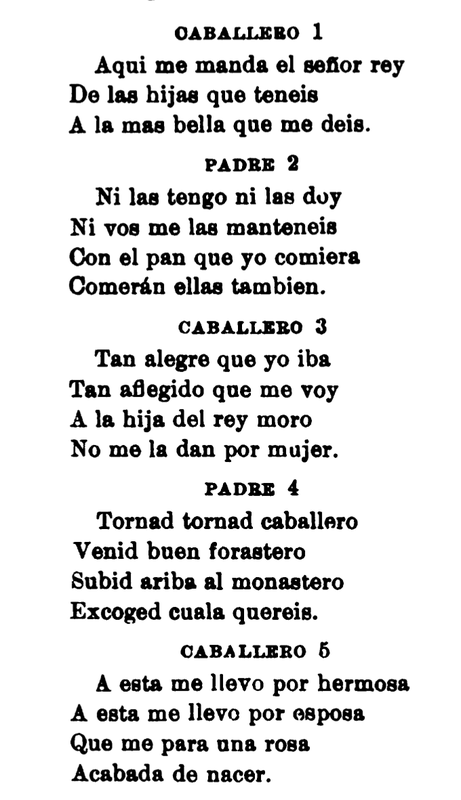 The original Spanish edition can be downloaded from Google Books as a PDF. Alcalay died young, in her thirties, on May 18, 1905, shortly after the book’s publication. 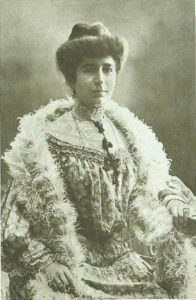 She wrote many pages of material about the Sephardic communities of Trieste and Bosnia and about other topics for that book. I hope to translate portions for a future blog entry. This entry was posted in Austria, Bosnia, Children, Gender, Italy, Marriage, Sephardic Jews, Songs. Bookmark the permalink.